It is often said that road trips bond teams together and make them gel. It's also said that comeback wins can do the same. After Texas went down by three goals in the first five minutes of the game tonight against Rockford, they had a chance to do both. They did, winning 5-4 over Rockford tonight in Illinois. To add to that mountain to climb, the Stars were outshot 37-19 and had to kill seven penalties on the night. Texas countered that with five goals on those nineteen shots including a 3/3 mark on the power play and a 5/7 mark on the penalty kill. The game also marked the first time Texas has come back to win after being down in the first intermission. Only 111 seconds into the game, Jimmy Hayes tallied the first goal for the IceHogs, a rebound goal and his fifth of the year. Marcus Kruger went next in the third minute of the game, another rebound goal, this time on the power play. Hayes added his second of the night in the fourth minute, again via rebound, and Texas was down 3-0 without a shot on net of their own. This was the decision point for the Stars. Down 3-0 just five minutes into the game, there was an opportunity here to give up, something that last year's team was guilty of at times. However, this year's edition has proven that they are resilient and willing to stage a comeback when needed. Antoine Roussel went first, on the power play. After an initial shot by Colton Sceviour, Roussel jammed away at the puck until it ended up over the line, much to the chagrin of Alec Richards, who protested the call. Alex Chiasson picked up his second of the year and the Stars second goal of the night just shy of the fifteen minute mark. The goal, a tip of a Jordie Benn point shot, cut the Rockford lead in the half. 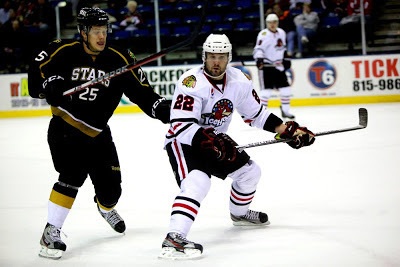 The Stars were outshot 15-7 in the first, but Rockford only led 3-2. The Stars rattled off two more in the second. Jordie Benn's shot on the power play found it's way through traffic to tie things at three. Cody Eakin and Tomas Vincour, who have both been on scoring droughts, had the assists. Reilly Smith finally scored his first professional goal after 18 pro games. Assisted by Mike Hedden, who had been scratched since November 10th, Smith's first goal came on his 34th shot of the season, a backhander after beating out an IceHog defender. It set the score at 4-3. Andrew Shaw redirected a shot on the power play to send the teams to the second intermission tied at four. Despite being outshot 12-3 in the final frame, Texas got the only goal that mattered. On the power play again, Colton Sceviour notched his fourth of the year, assisted by Travis Morin. Jack Campbell, despite the early scare, finished with 33 saves on 37 shots against. The win was the first in a game he started since October 24th against Milwaukee. Texas will face Grand Rapids in Michigan on Friday. Why was barker scratched he's easily one of if not the best defensemen they have . Can we Health Scratch the GM?? Isn't it time for him to move on?